On the one hand, ingesting mold can be greatly beneficial to us in the context of its roles in great medical advances such as penicillin or delicious culinary staples like cheese. But on the other hand looms the dark side of mold exposure, where inhaling mold spores into our lungs can cause severe health problems. Mold, as well as fungi and yeasts are all naturally occurring organisms that play a vital role in breaking down dead organisms outdoors such as leaves, plants, and trees as well as sustaining us through medicine and food production. But tiny lightweight mold spores are released into the air for them to spread and grow both outdoors and indoors, where we come into contact with them constantly in our day to day lives. When mold is growing indoors, the concentration of these spores becomes greater than it would be outdoors due to the confined space preventing them from spreading. They are so small that they can be inhaled deep into our lungs, potentially causing respiratory and other problems if inhaled in great enough quantities or in people with particularly sensitive or compromised immune systems. Illnesses which can be caused by mold include aspergillosis, blastomycosis, histoplasmosis, coccidioidomycosis, paracoccidioidomycosis, sporotricosis, and systemic candidiasis (a yeast infection). Symptoms from over exposure to mold depend on many factors, including the quantity you are exposed to, your own susceptibility, and the type of mold you encounter. The four main categories of mold with regards to their effects on humans are cosmetic, allergenic, toxigenic, and pathogenic. Those species which are unlikely to be hazardous to human health or cause damage to building structure, and a surface in which they appear may just be cleaned and coated for cosmetic reasons. Examples include Ophistoma sp.and Ceratocystis sp.which are known as “blue stain” fungi, causing no real damage other than discoloration. Those molds typically associated with an allergic response from people with particular susceptibilities to certain substances. Many of the most common household molds are allergenic in nature, including Penicillium, Aspergillus, Cladosporium, Alternaria molds. Common mold-allergic responses include Allergic Rhinitis, and Asthma. Allergic Rhinitis affects 20-30% of the population, while asthma affects about 5% of the population. The World Health Organization issued the WHO Guidelines for Indoor Air Quality: Dampness and Mould, a document which concludes that “the most important effects (of mold) are increased prevalences of respiratory symptoms, allergies and asthma as well as perturbation of the immunological system.” Some recent studies even suggest a potential link of early mold exposure to development of asthma in some children, particularly those who might have a genetic predisposition for it, but that select interventions for improving housing conditions could reduce these effects. Can cause infections especially in people with compromised immune systems, but may also affect people who are generally normal and healthy. These types of molds are not commonly found in homes, but rather usually grow on or in tissues of humans and other animals. These molds are technically their own classification, but are commonly lumped in with the toxigenic molds below due to similar health effects. Stachybotrys, aka black mold, is a toxigenic mold commonly found in homes and buildings, and is very toxic to humans as it produces a potent mycotoxin that can make you very sick. About 25% of Americans carry the human leukocyte antigen (HLA-DR) gene, which makes it more difficult for them to excrete mycotoxins. Their bodies are unable to recognize toxins as foreign invaders and necessary antibodies for removing the mycotoxins are not produced. This population of people is more likely to develop Chronic Inflammatory Response Syndrome, a severe inflammatory response to toxins such as mold. You can be tested for the HLA-DR gene, and especially may want to consider it if you already know you suffer from fibromyalgia, chronic Lyme, or another fatigue-related chronic illness. Breathing small amounts of mold is virtually impossible to prevent entirely as they are so prevalent, but the amount we breathe can and should be reduced as much as possible. Because molds are bound to specific moisture rich environments, we can avoid inhaling them via reducing moisture levels in our homes by increasing ventilation with proper HVAC systems and repairing leaks as quickly as possible. Molds also give signs of their presence not only by the visible colored spots, but also due to the fact that they destroy whatever surface they are living on. Airborne chemicals, gasses and particulate matter caused by this destruction can be searched for to identify the presence of mold. In addition to the mold spores themselves in the air, the breakdown products of molds, such as cell-wall particles, proteins, and volatile organic compounds also cause us harm as well as give away the presence of the molds with their characteristic odors. 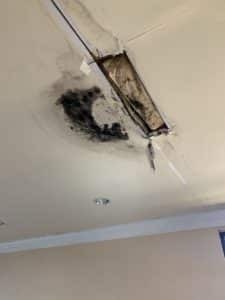 Specific types of molds can even be tested for, however the Center for Disease Control recommends that no matter what type of mold is present, you should have it removed. You should also avoid areas prone to mold growth, such as compost piles, cut grass, and wooded areas. We'll respond within 10 minutes!